We left on Saturday morning. 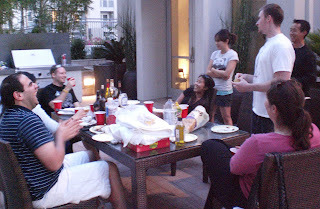 Thursday night, our friends had a going-away party for us over at Jim & Viv's. We had Korean BBQ, burgers, handmade spring rolls, shrimp kebobs, flan, banana-pudding-cake, and a variety of other things. And I mean crazy variety... we took two large boxes of everything we had left and let everyone just have what they wanted. Some stuff went faster than others, but in the end we got rid of a lot of stuff easily. We played Apples to Apples and shot some pool as well. 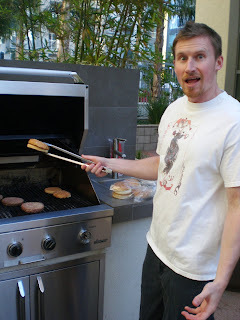 Jim doing some grilling Jonathan's ready to eat! Friday morning the movers came. At a whopping 9:06, which was pretty impressive. They were FAST compared to the movers who packed our FL stuff. By 10:45 or so, everything was gone. Jonathan went in to work to tie up some loose ends, and I packed the remaining bags (after all, we may have to live out of just a few bags until August!). We ran a ton of errands (library books, post office, Comcast, etc. 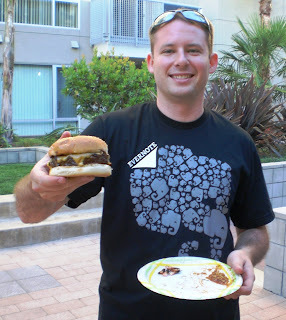 ), grabbed some In-n-Out one last time, and then took a nap. Andy, Jim, and Vivian joined us for dinner at Claim Jumper. The food was pretty good - I'd recommend the cheese potato cakes. I had the baked potato cheddar soup in a sourdough bread bowl for dinner, but it didn't stay hot by the time I was done. Most everyone enjoyed their choices, although the chicken-fried steak was looking a little ragged... probably because it was the end of the night so the oil had been used many times by that point. It was really nice to get to say a second goodbye to those three... we have done a lot together in the past six months. Jim has family in Orlando, so there's a good chance we'll see him and Vivian come Christmas. Andy is originally from the Newtown campus, so we'll see him when he visits his "home," too. 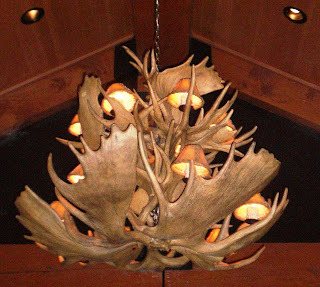 I really liked this antler lighting fixture at the restaurant.